A phishing scam where the person on the end of the phone tells you that a Mountain View IP is controlling your router is doing the rounds again. 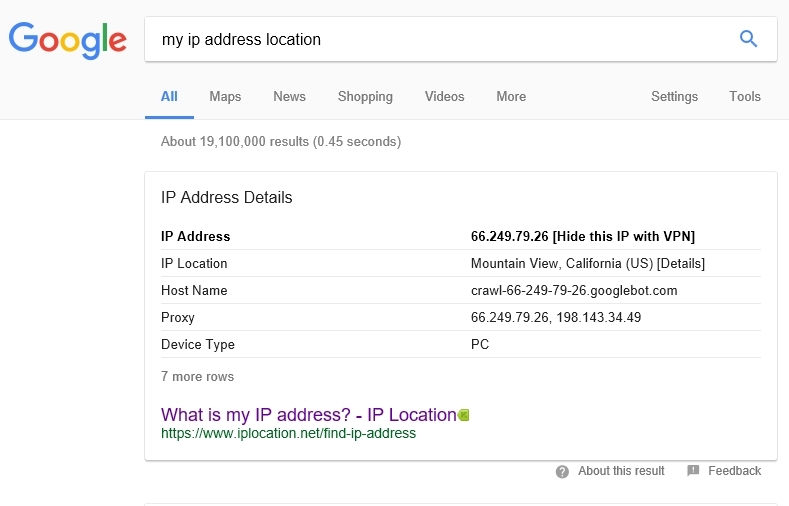 When you type My IP Address Location in to Google you get a Featured Snippet box for https://www.iplocation.net which all looks very genuine and may fool some people. What they don’t tell you though is that the Featured Snippet is generated from when Googlebot crawled https://www.iplocation.net/find-ip-address and the result you are seeing is effectively a cached snapshot of the page, i.e the result returned if Google was doing the test. The result you see isn’t your IP but is a Google IP which does come from Mountain View. https://www.iplocation.net has nothing to do with this scam, the scammers obviously saw the featured snippet and thought this looks like a good way of tricking people. Be careful out there folks and let me know in the comments below if this has happened to you. This happened to me, just now. I thought it sounded dodgy so did the same in my 4G connection and got the same. Terminated the call and now they won’t stop calling back.